charmcityartsmaven: A B-horror homage with dastardly heroes, maniacal villains, and insane antics! A B-horror homage with dastardly heroes, maniacal villains, and insane antics! 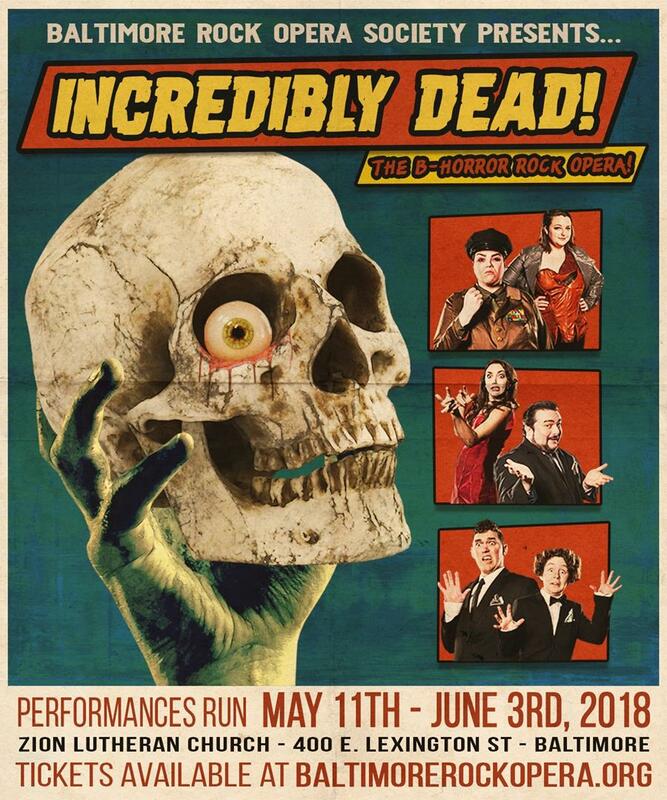 WHEN: May 11-12, 18-19, 25-27 & June 1-3; Friday & Saturday shows are at 8:00pm with doors at 7:30pm, with a matinee show June 2nd starting at 4:00 PM with doors at 3:30 PM. Sunday shows are at 4:00pm with doors at 3:30pm. *Due to adult language and people like, you know, dying and what not, BROS considers this show rated "R", and not appropriate for younger audiences. What do a barrel of toxic waste, an organ constructed from human cadavers, and two bumbling morticians with dreams of glory have in common? It's Incredibly Dead! A B-horror romp brought to you by the Baltimore Rock Opera Society. To focus on securing funding to renovate our new work and performance space (announcement coming soon! ), this will be the last full-scale BROS production of 2018. Tickets for Incredibly Dead! are selling fast and getting faster, so if you haven't gotten your BROS fix for the year, then don't miss this chance! Nearly 20 years ago, General Maximilian Morder devised a plan to bring order to the world with the aid of a mysterious goo. Things didn’t pan out. Now, the elixir is in the hands of Reggie and Silas Cryptz – two moronic morticians who have drawn the vile ire of a family they’ve cheated in the past. The antics of our heroes will lead to monstrous results, and a dire intersection with fate. “Incredibly Dead!” is pure B-horror; cheap thrills, intestine-length twists, and blood-drenched fun. The show is set to rockin’ tunes that pay homage to spine-tingling classics, and will sever tapping toes! This is pure, unadulterated fun (lots of people die, but we swear, you’re going to enjoy watching them die). Due to adult language and people like, you know, dying and what not, we would consider the show rated “R.” We want you to come to the show and laugh and clap and cheer and stuff that like. You know, have a good time! Let’s avoid upsetting younger folk, because that is not cool.